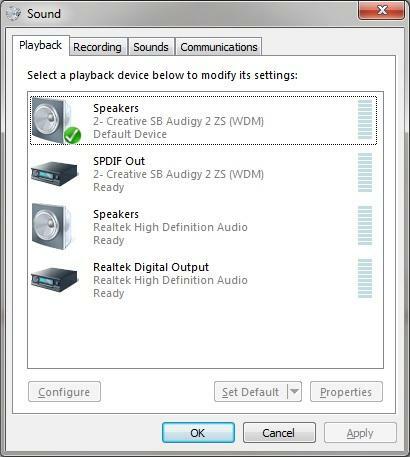 I have both onboard sound (Realtek AL892) and the Audigy 2 zs installed and enabled, they both work fine and will output audio according to which ever playback device is set as "default". - No device detected in "Sound - Playback Devices" so I am unable to select it as default audio playback device. 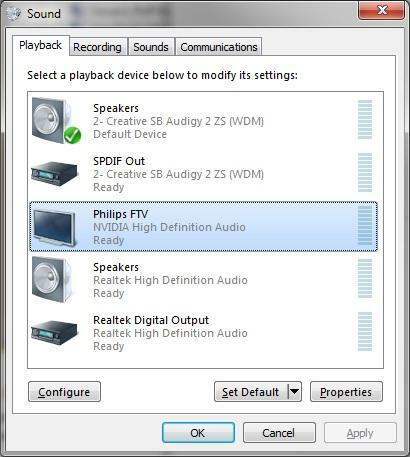 "Philips FTV-1" in "Sound - Playback Devices" and enable it. And the TV will output both video and sound. Any advise on how to get the onboard video detect the TV? So I can bitstream audio as well as video over HDMI? I would prefer this setup(onboard video to TV and geforce to 2xmonitors) rather than having the TV+viewsonic-monitor on the Geforce. i'd be interested in this as well. i recently switched to hdmi between my video card and monitor and no matter what i did i could not get sound through the hdmi cable. Alright, to clarify: There is no audio via hdmi to 6605 tv unless you connect it to your graphics card? What else are you trying to connect it to? If you are trying to connect to onboard, I doubt the onboard is powerful enough for your tv, although I am not entirely sure how good that tv is as i've not looked it up. 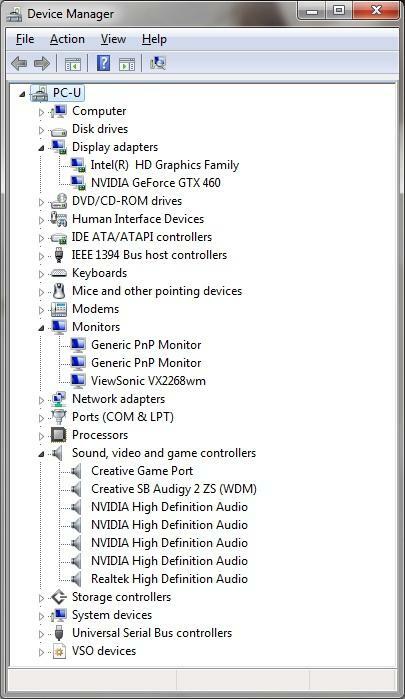 You use graphics cards for connecting ALL tvs and monitors, onboard usually only works low class for monitors and maybe some tvs. the more powerful the tv/monitor, the less likely onboard will work. Does this answer your question some? Or did I not get your meaning? Is the image on the tv impaired when you use onboard over the graphics card? why don't you try hooking up a tv and monitor the the graphics card and the other monitor to the onboard? If I am reading things right in regards to the manual and the Intel graphics driver, simply you don't. As I understand it the audio over HDMI is solely up to the integrated Intel graphics to the point that there is also an audio driver included in the video driver (I downloaded it and checked). Same applies to audio over HDMI from your 460 GTX; the onboard or a sound card don't matter. I would guess that the Intel audio doesn't show up in the playback options the same as the Nvidia one doesn't (second screen shot), until something is connected to it that makes use of it (last screen shot showing the TV and Nvidia audio). Thanks for your attempt to help! I am trying to connect my TV to the integrated graphics only. There are already two monitors connected to my video card. Yes you are right, I assumed the onboard gfx supported audio bit streaming but i could be wrong, am trying to find a confirm answer to this on intel's webpage but am not able to. Have tried plugging the TV into the intel HDMI port but the Intel audio does not show up in playback options. SO most likely this is all due to the fact that the interagted intel graphics does not support audio (bit-streamed) over hdmi..
Will read up and try to confirm this as i had assumed otherwise all along!! Take a look at the following and determine if your software is up to date. Sometimes updating the software can resolve the issue. Be sure to select your exact model / location from the site. If you're trying to Bitstream you connect to your receiver, not your TV. Windows detects the receiver as the monitor. Just make sure you have all hdmi 1.3 or above ports and hdmi 2.0 cables.... otherwise it won't work. Ugene - I have the same board and CPU as you and figured this out last night. You have to set your iGPU as primary in the bios then windows automatically loads the hdmi audio driver when you next login.